OEO works with a wide range of customers across many industries to provide a variety of LED lights and LED bulbs replacements. 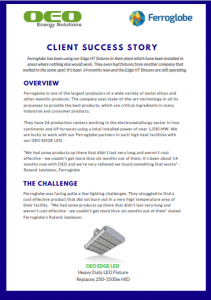 Check out some of our success stories and testimonials from our partners below to get a taste of the solutions and products we can provide for your company. 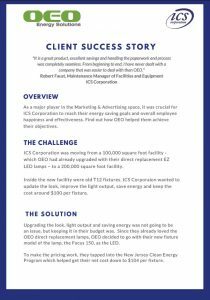 As a major player in the Marketing & Advertising space, it was crucial for ICS Corporation to reach their energy saving goals and overall employee happiness and effectiveness. Find out how OEO helped them achieve their objectives. Ferroglobe has been using our Edge HT fixtures in their plant which have been installed in areas where nothing else would work. They even had fixtures from another company that melted in the same spot! It’s been 14 months now and the Edge HT fixtures are still operating.